Back from the dead . . . For a visit. Every story is a ghost. Warning: This review includes mild spoilers for both Damned and Doomed. 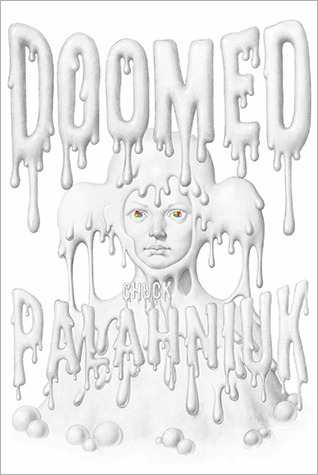 Doomed is the sequel to Chuck Palahniuk’s infernal novel Damned, which left readers either excited or frustrated when it ended on a cliffhanger. Madison Spencer was a modern day American princess. Born rich, arguably average-looking, and to movie star parents, she had the life most teenagers think they want: School in the Alps, magazine photo shoots, promo/vacation trips around the world with her family. But her life ended at the age of 13, and she found herself, to her surprise and anger, in hell. But now she’s back. Through some Halloween hijinks, Madison finds herself back on earth, wandering the world as a ghost. Maddy’s been dead for about a year, and as an outsider, the human condition is more obvious to her than ever: Our world of social media, fad religions, and self-glorification almost makes her feel she’s better off in hell. If Damned was a commentary on our society’s sins, Doomed is a commentary on our society’s flaws. Madison gets a new perspective on everything as her ghostly adventures include walking through walls, dodging psychics trying to interview her, and tolerating the ghost of her kooky grandmother. Rest in peace. And if Maddy was annoyed with her egotistical parents before, she’s going to be perturbed completely by what her untimely death has galvanized them to do. The whole thing feels rather… pre-apocalyptic. The ending is more satisfying than Damned‘s. And yes, Dante fans, I think it’s safe to assume where Palahniuk’s next book will take us. This entry was posted in Required reading. Bookmark the permalink.